Too much Thanksgiving dinner? Relieve the feeling with a local digestif. Turkey. Stuffing. Mashed potatoes and gravy. Cranberry sauce. Pumpkin pie. Mushroom cutlets (if you’re a vegetarian in my family). Numerous other regional and family-driven culinary delights. Thanksgiving is a tasty holiday where we celebrate all the things we’re thankful for, sure, but also just how much we can eat at once. Tables and then stomachs are usually stuffed, and then overstuffed. While the eating lightens the table, for the stomach, I suggest sipping a good digestif. Digestifs are (for those who haven’t heard the word), drinks consumed usually after a big meal to aid digestion. Different people swear by different ones, but I think we should give thanks to our wonderful local distillers this year by consuming locally made digestifs. I’ve rounded up five great options below. You can find most in local liquor stores but going by the distilleries to get product at the source is fun, too. While all partner nicely in cocktails, in this situation, you’ll want them straight for maximum relief. An Italian stalwart, Nocino is a walnut liqueur traditionally made from green walnuts, and Sidetrack follows that tradition, harvesting the walnuts right before “the squirrels have a chance to get them.” They follow the Italian Nocino style, too, which means you’ll enjoy a rich, nutty, spicy flavor with an underlying kick and a hint of bitter that’ll cut through that second helping of stuffing. As with all products from this charming distillery in the nearly hidden farming valley south of Kent, they grow the produce to make their Nocino on the farm surrounding the distillery. Their fruit brandies, as well as their memorable Lemon Verbena liqueur, would also be nice after the big meal. Amaro (or amari) are herbal and spice elixirs containing anywhere from a hint of bitter to a punch, and are exceeding popular for their curative powers after dinner in Italy, where every family has a favorite. 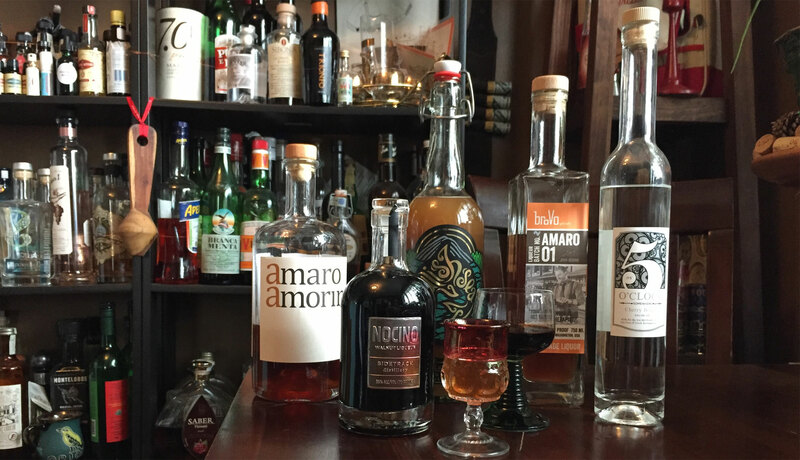 Woondiville’s broVo Spirits have made a number of worthy amari in conjunction with bartenders. While all are worth trying, the multiple award-winning #1 remains my favorite. Developed by John Ueding, a longtime member of the Seattle bar community who now manages The Reef dispensary, Amaro #1 delivers spices like clove and cardamom backed by layers of citrus and a peppery finish. It’ll match the meal and ease the excess. We tend to think of “liqueurs” as shading too far on the sweet side to be a proper drink to have after you’ve consumed excessively at the table, more an accompaniment to dessert then curative. But Salish Sea—who make a nearly unbelievable variety of organic liqueurs—doesn’t over-sweeten, especially with this one, which has a singular ginger character: a rounded lushness combined with a high level of ginger heat and bite not usually seen on the liquor shelf. Ginger is, in most spots worldwide, considered a key digestive ministration after loading up (as well as when your tummy’s just not feeling right), too. Our second amaro has a family connection to the country that inspires it (and all amari): Italy. See, it’s named for Sodo-based Letterpress owner and distiller Skip Tognetti’s grandfather Amorino Pinti, born in a village in Abruzzo, Italy, before eventually opening a liquor store in the middle of Rome, where Tognetti learned about spirits and liqueurs and digestifs. It’s a good story to tell as you’re patting your overfull belly and sipping this assisting amaro, which has a welcoming combination of Seville orange peel and baking spices, alongside a moderate bitterness and a layer of floral notes that’ll remind you of early spring. Fruit brandies, or eau di vies, are traditional post-meal potions in many parts of the world (to learn even more about these beauties and discover a whole bunch being made here, check out our full Washington state fruit brandy article), and are slowly becoming more well known here. The best are like this cherry version made by It’s Five distillery in Cashmere: dry, strong but easy to sip and wonderfully welcome after you’ve had one piece of pie too many. You’ll discover a pure cherry-ness here, with notes of almonds and a sigh of citrus. I go round and round on whether to have it at room temperature (a good first step) or chilled.